1National Institute of Plant Genome Research, New Delhi, India. 2Banaras Hindu University, Department of Biotechnology, Varanasi. 3Amity Institute of Microbial Technology Amity University Uttar Pradesh, E-2 Block, 4th Floor, Room # 404A, Sector 125, Noida, Uttar Pradesh, 201313, India. 4Stress Physiology & Molecular Biology Lab, Centre for Biotechnology, MD University, Rohtak – 124 001, Haryana. Piriformospora indica is an endophytic root-colonizing fungal species classified in the genus Piriformospora of the order Sebacinales. The chlamydospores of P. indica has a typical pear-shape and it was first discovered from the orchid plants in the Thar desert in Rajasthan, India and thus named P. indica. Piriformospora indica is an endophytic root-colonizing fungal species classified in the genus Piriformospora of the order Sebacinales. The chlamydospores of P. indica has a typical pear-shape and it was first discovered from the orchid plants in the Thar desert in Rajasthan, India and thus named P. indica [1,2]. It is an axenically cultivable phytopromotional endosymbiont, which mimics the capabilities of Arbuscular mycorrhizal fungi, AMF. The complete genome of P. indica has been sequenced recently making it a promising candidate for better understanding of the molecular basis for plant– microbe interactions and evolution of plant–fungus associations . Pyrosequencing of the P. indica genome was performed in corresponding to RNA-Seq of cDNA pooled from various fungal developing stages. The fully sequenced genome size is around 24.97Mb which is constructed into 1884 scaffolds containing 2359 contigs. Bioinformatics and manual analysis of the P. indica genome assembly have shown the presence of single nucleotide polymorphisms (SNP) with two different variants. A total number of 60493 equally dispersed SNPs could be identified in scaffolds covering 23.15 Mb (92%) of the whole genome sequence (2.6 SNPs per kb) . P. indica do not cause any visible disease symptoms during colonization of the plant host. Instead, its interaction is rather mutualistic with benefits for both, the plant and the fungus. This fungus helps the plant by promoting its growth, enhances the seed production, increases nutrient uptake, and increases the resistance against different pathogenic and environmental stresses that could be observed in the host when colonized by P. indica [4-11]. The phytopromotional effects of P. indica on a compatible photosymbiont do not necessarily demand the physical contact of the mycelium, but it has also been observed that the treatment of the host with small amount of the culture filtrate could also enhance the growth promotion in plants. After colonization with plant, P. indica improves the cellular mechanistic pathways against biotic and abiotic stresses, ROS scavenging and proteome machinery of endoplasmic reticulum and Golgi body (Figure 1). Figure 1. Growth of tomato and Brassica plant with P. indica. P. indica has shown to be very versatile as it is capable of colonizing a variety of different plants, but the research studies has been done so far to understand molecular mechanisms underlying symbiosis has basically on the agronomical important monocotyledonous crop plant barley (Hordeum vulgare) and the dicotyledonous genetic model plant Arabidopsis thaliana . During colonization of root, plant host induces the expression of defense-related genes which is in turn reprogrammed and actively suppressed by the P. indica for its own survival and to establish the beneficial interaction [13-15]. Further, it has also been demonstrated that in P. indica-colonized roots, expression of various defense-related genes like pathogenesis-related (PR) genes, ethylene signaling molecules and ethylene-targeted transcription factors are mildly up regulated during the initial stages of colonization but down regulated in the later stages supporting the idea that either the fungus does not stimulate extensive defense gene expression for longer periods or they down regulate them after an initial activation period [16,17].This could also be added to the insight information on the involved defense mechanism that this fungus turns to parasitic rather than beneficial when certain compounds cannot be produced in the roots as observed in some knock-out/deletion mutant in plants . 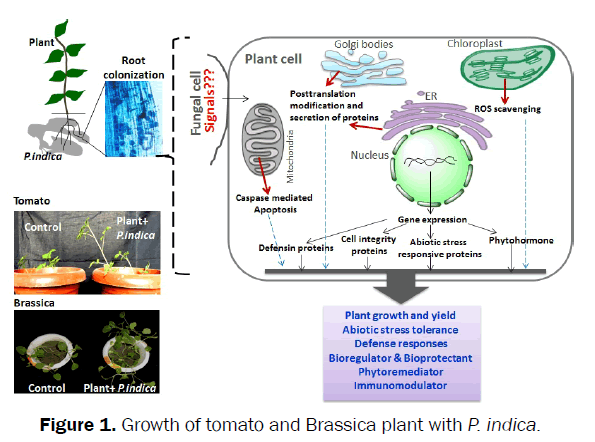 We have shown better growth of tomato and Brassica plant with P. indica (Figure 1). A number of plant mutants have been isolated, in which growth is inhibited rather than promoted in the presence of P. indica, indicating that the fungus is parasitic rather than beneficial when the mutated compounds cannot be produced in the roots . PYK10 gene which codes for a root and hypocotyls specific betaglucosidase/myrosinase and required for beneficial interaction with the fungus. PYK10 restricts root colonization by P. indica, which results in the repression of defense responses and the up regulation of responses leading to a mutualistic interaction between the two symbiotic partners . The beneficial effects of P. indica can be seen mostly in the aerial parts of the plants, indicating the involvement of Phytohormones, such as jasmonic acid, methyljasmonate, ethylene or salicylic acid as information messengers . Therefore, the increased disease resistance could be linked to a modulation of the basal phytohormone levels within the host [15,16,18]. Studies at the cytological level reveals that for barley, P. indica establishes a biotrophic interaction in this host which is characterized by an intact, invaginated plant plasma membrane surrounding penetrating fungal hyphae [3,15]. This interaction remains in barley for five to seven days and is accompanied by the expression of small secreted proteins . P. indica switches to a cell death associated growth after initial biotrophic interaction, which can be characterized by a massive proliferation and spore formation eventually within dead rhizodermal and cortical cells [3,19]. BAX inhibitor-1 (HvBI-1), which is a negative cell death regulator is suppressed in P. indica colonized barley roots from five days onwards . Nevertheless, the colonization of barley roots by P. indica is also at later stages of the interaction beneficial for the plant as indicated by a strong growth promotion effect. Endophytic colonization of Arabidopsis roots by P. indica were also shown to occur in two distinct phases similar to the interaction with barley except late colonization of Arabidopsis cells was shown to be accompanied by an ER stress–induced caspase-dependent cell death . P. indica confers abiotic stress tolerance, particularly against drought in Arabidopsis thaliana and Chinese cabbage [7-9]. Drought-related genes ANAC072, CBL1, DREB2A, and RD29A were shown to be unregulated in the drought-stressed leaves of colonized plants. Recently, It has been reported that P. indica can seize cadmium (Cd) in Nicotiana roots, therefore less Cd was transported to leaves . It also improved the antioxidant pool and chlorophyll contents of Nicotiana. P. indica can colonize different plant hosts, moreover this fungus can grows well on different synthetic media and interestingly many saprotrophic traits could also be identified in its genome . Mostly in halophytic plants, the plant tissues produce an amino acid proline to cope up with the osmotic stress . The plants colonized by P. indica have higher concentrations of proline that is known to be responsible for tolerance against osmotic stress tolerance might be the reason for drought-tolerant trait of P. indica colonized plants in comparison to control plant . Plants produce antioxidants in response to elevated reactive oxygen species (ROS), and it has been established that accumulation of ROS can induce the level of protective antioxidants which in turn responsible for the tolerance level against abiotic stress [24,25]. Furthermore, increased level of two main antioxidants ascorbate (AsA) and glutathione (GSH) also plays role in conferring such traits to P. indica colonized plants . In P. indica colonized plants has low level of malondialdehyde (MDA), which is used as a biomarker to measure the level of oxidative stress, suggesting that P. indica prevents the colonized plant from oxidative stress. The antioxidant enzyme like superoxide dismutase (SOD), catalase (CAT) and peroxidase (POD) were also found to be over-accumulating in the colonized plant. Recently, it has been reported that a novel gene PIIN_08944 enhanced the colonization process and induce the Salicylic acid (SA) mediated defense pathway in Arabidopsis . P. indica helps in degradation of Petroleum components in deep layer of soil . P. indica has a broad host spectrum, including monocotylednous, dicototylednous as well as Brassicaceae family, which cannot be colonized by the mycorrhizal fungus. Plant responses to colonization by P. indica can range from a variety of growth and yield advantages including tolerance against biotic and abiotic stresses. The growth promotion may be due to the transfer of nutrients by the fungus to the plant and phytohormone secreted by colonized fungus. P. indica has been considered to have enormous bioprotective potential against phytopathogens and pests of agronomical and horticultural crops. Further, it is shown to stimulate high biomass production, early flowering, seed and seed oil production and imparts biological hardening to tissue culture-raised plants [1,11]. The conjugation of modern phylogenetic with advanced immunological techniques has provided new insights to add the knowledge about further aspects of mycorrhizal functioning. The future research on lifestyle of P. indica would certainly focus on unraveling the mycorrhizal symbiosis through genetic engineering of the fungal component by introducing genes like fluorescent reporters to trace their distribution, dispersal in nature, colonization patterns and demographic factors during the symbiotic events. Presently, the structure of two proteins has been solved from P. indica such as cyclophilin and Phosphate transporter having chaperone and transportation activity respectively . A high affinity phosphate transporter from P. indica (PiPT) structure was solved at 2.9 Å which showing an inward-facing impeded state, with bound phosphate evident in the membrane-buried binding site. This is novel and first transporter structure which provides a strong platform and template for structural modeling for key transporter who’s associated with diseases in human such as cancer. One more crystal structure has been reported from P. indica such as cyclophilin which acts as molecular chaperone of biological system. Crystal structure of P. indica cyclophilin (PiCypA) was solved at 1.97 Å resolutions. PiCypA provides salinity stress tolerance to plant, which is first time direct evidence of fungal gene expression in plant under such stress . With a concluding remark, the better understanding of PGPR activity, phytohormone signaling, resistance against biotic/ abiotic stresses and role of fungal genes would lead to pave the new path for biotechnological potential and application of P. indica as important fungus for sustainable agriculture. Also there is further progress need to be made to improve inoculum formulation, preparation, production and stability in order to open the novel ways towards the increased application of P. indica by farmers in the agricultural fields of private and government sector. Verma S, et al. Piriformosporaindica, gen. nov. sp. nov., a new root-colonizing fungus. Mycologia. 1998;90:896-903. Varma A, et al. Piriformosporaindica, a cultivable plant-growth-promoting root endophyteAppl Environ Microbiol. 1999;65:2741-2744. Zuccaro A, et al. Endophytic life strategies decoded by genome and transcriptome analyses of the mutualistic root symbiontPiriformosporaindica. Plos Pathogen. 2011;7:e1002290. Achatz B, et al. Root colonization by Piriformosporaindica enhances grain yield in barley under diverse nutrient regimes by accelerating plant development. Plant Soil. 2010;333:59-70. Baltruschat H, et al. Salt tolerance of barley induced by the root endophytePiriformosporaindica is associated with a strong increase in antioxidants. New Phytol. 2008;180:501-510. Peskan-Berghofer T, et al. Association of Piriformosporaindica with Arabidopsis thaliana roots represents a novel system to study beneficial plant-microbe interactions and involves early plant protein modifications in the endoplasmic reticulum and at the plasma membrane. PhysiologiaPlantarum. 2004;122:465-477. Sherameti I, et al. The rootcolonizingendophytePirifomosporaindica confers drought tolerance in Arabidopsis by stimulating the expression of drought stress related genes in leaves. Mol PlantMicrob Interact. 2008;21:799-807. Sun CA, et al. Piriformosporaindica confers drought tolerance in Chinese cabbage leaves by stimulating antioxidant enzymes, the expression of drought-related genes and the plastid-localized CAS protein. J Plant Physiol. 2010;167:1009-1017. Vadassery J, et al. The role of auxins and cytokinins in the mutualistic interaction between Arabidopsis and Piriformosporaindica. Mol Plant Microbe Interact. 2008;21:1371-1383. Waller F, et al. The endophytic fungus Piriformosporaindica reprograms barley to salt-stress tolerance, disease resistance, and higher yield. ProcNatlAcadSci USA. 2005;102:13386-13391. Yadav V, et al. A phosphate transporter from the root endophytic fungus Piriformosporaindica plays a role in phosphate transport to the host plant. J Biol Chem. (2010);285:26532-26544. Qiang X, et al.Piriformosporaindica-a mutualistic basidiomycete with an exceptionally large plant host range. Mol Plant Pathol. 2012;13:508-518. Camehl I, et al. The OXI1 kinase pathway mediates Piriformosporaindica-induced growth promotion in Arabidopsis. PLoSPathog. 2011;7:e1002051. Jacobs S, et al. Broad-spectrum suppression of innate immunity is required for colonization of Arabidopsis roots by the fungus Piriformosporaindica. Plant Physiology. 2011;156:726-740. Schafer P, et al. Manipulation of plant innate immunity and gibberellin as factor of compatibility in the mutualistic association of barley roots with Piriformosporaindica. Plant J. 2009;59:461-474. Camehl I, et al. Ethylene signalling and ethylene-targeted transcription factors are required to balance beneficial and nonbeneficial traits in the symbiosis between the endophytic fungus Piriformosporaindica and Arabidopsis thaliana. New Phytologist. 2010;185:1062-1072. Stein E, et al. Systemic resistance in Arabidopsis conferred by the mycorrhizal fungus Piriformosporaindica requires jasmonic acid signaling and the cytoplasmic function of NPR1. Plant Cell Physiol. 2008;49:1747-1751. Deshmukh S, et al. The root endophytic fungus Piriformosporaindica requires host cell death for proliferation during mutualistic symbiosis with barley. ProcNatlAcadSci USA. 2006;103:18450-18457. Qiang XY, et al. The mutualistic fungus Piriformosporaindica colonizes Arabidopsis roots by inducing an endoplasmic reticulum stress-triggered caspase-dependent cell death. Plant Cell. 2012;24:794-809. Hui F, et al.Piriformosporaindica confers cadmium tolerance in Nicotianatabacum. J Environ Sci (China). 2015;37:184-191. Moore PD. Proline implicated in halophyte osmotic adjustment. Nature. 1975;253:399-400. Zarea MJ, et al. Effect of Piriformosporaindica and Azospirillum strains from saline or non-saline soil on mitigation of the effects of NaCl. Soil BiolBiochem. (2012);45:139 -146. Foyer CH and Shigeoka S. Understanding oxidative stress and antioxidant functions to enhance photosynthesis. Plant Physiol. 2011;155:93-100. Akum FN, et al. The Piriformosporaindica effector PIIN_08944 promotes the mutualistic Sebacinalean symbiosis. Front Plant Sci. 2015;6:906. Zamani J, et al. The effect of Piriformosporaindica on the root development of maize (Zea mays L.) and remediation of petroleum contaminated soil. Int J Phytoremediation. 2016;18:278-287. Pedersen BP, et al. Crystal structure of a eukaryotic phosphate transporter. Nature. 2013;496:533-536. Trivedi DK. et al. Structure of RNA-interacting cyclophilin A-like protein from Piriformosporaindica that provides salinity-stress tolerance in plants. Scientific Reports. 2013;3: 3001.